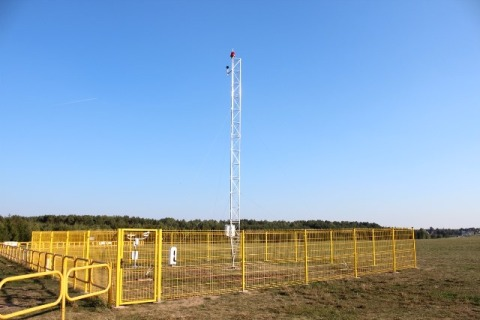 A Campbell Scientific weather station has recently been installed at the Olsztyn-Dajtki airport in Poland, providing pilots with real-time meteorological data for what is a challenging landing strip. The Polish Aero Club of Warmia-Mazury operates a small, general aviation airfield in northern Poland. The airfield has a very short (850m) landing strip situated very close to a forest; an environment that forces pilots to pay special attention to the visibility conditions on approach. To provide enhanced weather information, the Aero Club decided to install a state of the art Campbell Scientific weather station. The installation, partly financed by EU funds, aims to provide up-to-date weather data to pilots, including all relevant weather parameters such as visibility, cloud base height, temperature, dew point, density altitude, wind direction and speed, QNH and QFE barometric pressure. When asked about the installation, Bogdan Kozlowski, Head of Training of the Aero Club, said that "the good thing about working with Campbell Scientific is the flexibility of their systems. One can choose exactly what data is presented on our interfaces. For example, density altitude was included at our request, which is important additional information for our pilots. Furthermore, it is possible to install additional components for a wider range of measurements." In terms of the reliability and accuracy of measurements, Mr Kozlowski emphasized that these are checked regularly by the Aero Club and they can report a very satisfactory level of accuracy and reliability, even during the harsh winter period. Cloud height, for example, is regularly checked by comparing the cloud height measured by the system with the cloud height as reported by the pilot in the plane. • Ultrasonic anemometer to measure the speed and direction of the wind. • CS106 barometer to measure QFE and calculate QNH and QFF barometric pressure. • Air temperature and relative humidity probe. • CS135 Ceilometer to measure cloud base height. • PWS100 for visibility and present weather data. The CR1000 datalogger collects data from wind, air pressure, temperature and humidity sensors all installed on a retractable 10 m aluminium mast. These devices are powered by a battery which provides back-up power for up to 3 days in the unlikely event of a long power failure. Data is stored by the datalogger, which transmits the data to a computer via Wi-Fi. The weather information is displayed on the website of the Aero Club to provide global access to the current weather conditions in Olsztyn. The website is refreshed every 5 seconds to ensure real-time weather data updates. To make use of a wide range of functionalities, customized interfaces and reliable data presentation, the Aero Club chose LoggerNet, Campbell Scientific datalogger support software, and RTMC Pro for the display of weather data on their website. Datalogger and software transmit data wirelessly via Wi-Fi. Wind speed and direction are measured by an ultrasonic anemometer which has no moving parts. This makes it exceptionally fault tolerant, resistant to mechanical damage and reduces maintenance costs. Sensor readings are displayed on the website and data is presented as wind direction, with current speed in metres per second (m/s) and knots as well as maximum speed during the last hour. This is the first time such a unique solution has been installed in Poland, and it will improve the safety of pilots landing at Olsztyn-Dajki airport significantly. The barometer is designed to determine following air pressure parameters: QFE (pressure at the weather station), QNH (parameter indicating the average pressure at sea level to determine the altitude of a plane) and density altitude (calculation of the actual height of a plane by the means of atmospheric pressure and prevailing atmospheric conditions). All parameters are measured according to ICAO standards. QFE and QNH data are presented in digital form and the graph depicts the measurements of the last 2 hours on the website. In addition to temperature and humidity, this system provides dew point data. The system also includes a state of the art visibility sensor which uses laser measurements and is able to detect precipitation type and size and number of drops. The installed Campbell Scientific ceilometer measures cloud base height. The laser-based sensor is able to measure up to 4 layers of clouds simultaneously with a measurement range up to 10,000 m.